Is penetration testing required for HIPAA? Yes. Learn more on our HIPAA Penetration Testing page. Is penetration testing required for SOC 2? Yes. Learn more on our SOC 2 Penetration Testing page. Is penetration testing required for PCI DSS? Yes. Learn more on our PCI DSS Penetration Testing page. What are the differences between Black, Gray, and White Box penetration tests? What is the difference between a vulnerability assessment and a penetatration test? What happens if during the penetration test you discover we already have an infection? This is quite common. Any existing malware or breaches discovered during the penetration test will immediately result in a cessation of testing and be brought to the attention of the designated Point of Contact (POC). We can help with incident response, digital forensics, and malware analysis. Is the penetration test performed remotely or onsite? For an External Penetration Test against your internet-facing systems, we perform this service remotely. For an Internal Penetration Test, we travel to your location and perform this service onsite. To leverage the fact that we will be traveling to your location, we offer to bundle (at a discount) other services that require us to be onsite with the Internal Penetration Test, such as our Wireless Security Assessment and Physical Security Review. What are some of the common tactics used for Social engineering? 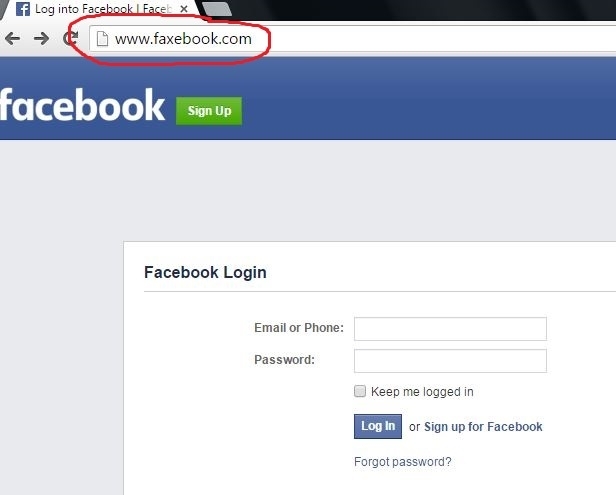 Example of a fake Facebook page, designed to steal Facebook credentials. Is the social engineering test performed remotely or onsite? Typically we perform the Social Engineering Test remotely, unless In-person social engineering is requested. What are some of the common tactics used for Phishing? Fear - the message elicits fear, causing you to take action, such as a message claiming your computer is infected and infecting other computers and you may be fined unless you "take action"
What is the difference between phishing, spearphishing, and whaling? Phishing is where a wide net is cast on a large group of users. An example of phishing is a fake LinkedIn invite sent to all users of an organization. Spearphishing is targeted phishing. A subset of users is targeted and the phishing email is more specific than in phishing. An example of spearphishing is a email sent to the IT department, spoofed from the CTO, about the new two-factor password policy (attached as a PDF). Whaling is targeted phishing, but the targets are the "whales" of the organization. The whales are typically the "C Level" users, like the CEO, CIO, CFO, COO, etc., or "VP" level users. Is the email phishing test performed remotely or onsite? Example of IRS Phishing Email. Notice the "From" and "Reply-To" addresses. If phishing is done properly, the email should look very realistic and be hard to tell from a legitimate email. Below is a sample phishing email from the "IRS". Checking the "From" and "Reply-To" and hyperlinks can be used to reveal the email is not legitimate and is phishing. Is Social Engineering or Phishing part of penetration testing? Yes, social engineering and email phishing can be used as part of a penetration test. We prefer to offer our services in a line-item style so you can choose what works for you. We also do "pure" penetration tests where we use a combination of multiple tactics, such as physical (tailgating, badge cloning, etc. ), social engineering, and technical. If you are interested in this type of service, please contact us.